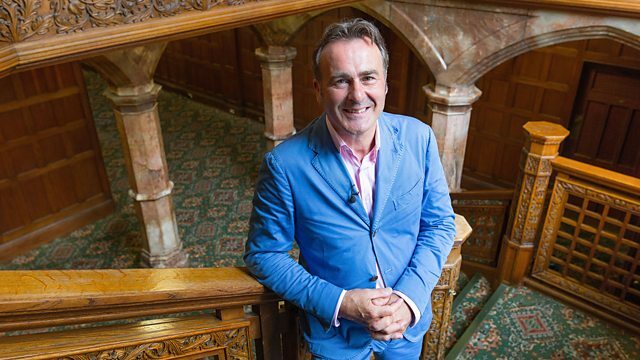 Peterborough 9 ‹ Series 10 Reversions ‹ Flog It! Antiques programme. Paul Martin presents from Peterborough's gothic cathedral, with experts Philip Serrell and Charlie Ross. Browse content similar to Peterborough 9. Check below for episodes and series from the same categories and more! in search of unwanted treasures to liberate and resell. will go home with a lot of money. we're going to have no problem at all! So come on, everybody, are you ready? Let's "Flog It!"! The locals have turned out in their droves. Here to sift out the prized antiques are Philip Serrell and Charlie Ross. I'm hoping they each manage to find something to cluck about today. when he comes across an old fan. That's absolutely... Pfff! I think that's staggering. How have you managed to look after it so well? when he values a beautifully preserved Georgian chair. It's not really something you want to sit on! No! Not for too long, anyway! and acclaimed 18th century peasant poet. It's over to Charlie for a spot of tea. -Presumably you know what you've got here, do you? -To a degree. You know it's a tea service. -And you know what it's made of? -Do you know how old it is? -Do you know who made it? Ooh, well, I'm very excited by this. -This is made by Robert Hennell IV, 1874 in date. Robert Hennell is one of the great, great names in English silversmiths. -the bobbin decoration. Very ornate, isn't it? rather flies in the face of the decoration. -..and not a late-19th century teapot. bags of room for sugar and for milk. I like the shape of the handles. Here you can see a little buffer between the two bits of silver. -You know why that's there, don't you? -Stop your hands getting hot. It's a very good conductor of heat - silver. -you wouldn't be able to pick up the tea. Now I'm going to turn one of these pieces upside down. what we have are all the elements that we would expect to find. We have the lion passant - that simply tells you it's silver. -I was going to say London. -London is correct, absolutely right. We have Queen Victoria's head here, just as a small aside. they didn't have her head on there. but that's an aside - we can see her head there. And we've got a T letter date which I have checked to 1874. -And here we've got the magic initials RH, Robert Hennell. -that were specifically made to order for someone. So this was made for somebody pretty special. -Was it made for your family? -Be nice to think that it was. this engraving must've been put in at the same time as it was made. to make way for the lettering. Going to have a quick look inside. a cup of tea in their lives in there. Superb. Value? Come on. Have a stab. I was thinking perhaps somewhere between 400, maybe £500. I think we've got a pleasant surprise for you here. but if you were to melt that down, it would come to £500 plus. but I think we'll probably end up at 800.
and come back with a bit of Robert Hennell so I think it's sensational. I feel very privileged to see a piece of Hennell today. Philip is already in full swing, chatting up his first customer. What's a girl like you doing in a place like this?! What's a girl like you doing with a gent's pocket watch? "Well, if you're going, see how much Granddad's watch is worth." Does your husband know that you're flogging Granddad's watch? -This isn't going to be the cause of a marital rift, is it? -So FW Philpott, Faversham. Where's Faversham? -I think that's the retailer. -It's got .375, so it's nine-carat gold. -This isn't working at the moment. So, what's the value? -Yes, it could be repaired. -that they get it repaired. -Cos it's a nice watch. -In the gold, I suppose. ..is in that gold case. and actually gets it fixed and gets it running. I'd like somebody to buy it who appreciates it more than what we do. -It sits in a drawer. It's a shame. -People don't wear them any more. -In terms of value, it's not going to have massive value. I think you're going to be looking at around £100 to £150. -And that's for the gold value. probably four, five years ago. -that doesn't imply that everything gets melted. It's a starting price. You can work up from there in increments. if you could give those auctioneers 10% discretion if they need it. -Yes. I would've liked more, but...! What's he going to think when he gets back from, where is he? I've heard of selling the family silver, not the family gold! -Will he? What will you spend the money on? We're going on holiday to Malta. I'd like to swim with dolphins. -Or maybe just a dining room carpet! -I think I know what I prefer. -I think I prefer dolphins, too! Let's get it sold and hope it does well. You might be able to do both! adds some extra silver to her family's coffers in just a minute. with an unwanted item that Mark found in a junk box. Have you been off to a boot fair? -in a box of junk in the garage. -So it came free with the house? How amazing. How long did it take you to find? so it made it quite nice. -How extraordinary. How long ago was that? I would say that it's about 1820, 1830. -The first part of the 19th century. -because it's got German writing on the bottom here. But Van Dyck, underneath "L'apres la memes". -Why have we got French writing here? "L'apres la memes" - "after the same". -In other words, this is a copy of a Van Dyck portrait. -Shame it's not the original, isn't it? other than this word, which is "made by". It's got the names of the people that made it. -which is really nice. Beautiful handwriting. -The problem, we have got some damage here. And it's not an easy thing to repair. -would really want to repair it. It's just charming as it is. I'd like to see a come-and-get-me saleroom estimate of 40 to 60. -With any luck, the bidding will take it beyond there. make Mark some money for nothing? Stay tuned. and Philip Serrell has spotted a gorgeous Georgian chair. Let's take a closer look at what he's got to say. -You got this in the car all right? -With a bit of help! -And everybody at home will think that you brought a chair along. -But there's a few telltale signs that we know it's not a chair. The first clue is, this has got a really deep frieze along the front. The frieze is that little bit there. And it's deep because its job is to hide something, isn't it? What it's hiding is a gazunder. There would've been a pot in there, and this is actually a commode. -All right? But I think it's just fabulous. So tell me, has this been in your family a long, long time? and I inherited it from my Auntie Joyce. -So it's come down the line the last 100 or so years. What I love about this... Let's start at the top. and that top cresting rail. And then as we work down, we've got that marvellous central splat there. For me, one of the best bits of this chair, look at that arm. and it comes round in that wonderful sweep. -And then you've got this great turning at the end. OK? -Do you know what timber it's made of? -I wasn't sure if it was oak. Well, I know my grandma used it, but it predates her. So, your grandma would be... What, that would be about 1920? Yes, just prior to 1900. -So, this could be 1860? and that was basically his design book for furniture. -And I just think it's a fabulous, fabulous thing. And I'd love to own it. you don't really want a commode in your front room, do you? Anybody got £50 I can give this good lady for it? Well, let's play a game. Forget it's a commode. -If this was a chair, what would it be worth? but I think, at its height, a chair like this would've been £300-500. ..the fact that it's a commode, it really does bring it down. And I think we need to estimate it at £100 to £150. I think we'll put a fixed reserve of £80. And if you have a really good day, it could fly through that. I'd love to own it. It's a really good-looking thing. -Happy to put this in auction? It's not something you want to sit on and think about, is it? It may be a commode, but it has excellent provenance. and you could end up going home with a lot of money at auction. just log on to our BBC website at bbc.co.uk/flogit. plus a lot more about what goes on behind the scenes. and here's a quick reminder of what we're taking off to auction. where auctioneer David Palmer is wielding the gavel. At this auction house, they charge 15% plus VAT. so let's head straight into the saleroom. It's Elizabeth's commode. Philip put the valuation on it. -Hi. Pleased to meet you. You gave up your Saturday to come to an auction! Why are you selling the commode chair? It doesn't fit properly anywhere, does it? -Where do you put a commode? and you've got a great antique! -It's worth £100 for the arms. Here it is, look on the screen up there. Old Georgian commode. 50 quid! 50 quid for the commode! 50? 50 here. -That's a good selling point. All done at £50? Is that it? Are you done with it at 50? Take five anywhere. Nothing on the net? 50 only? The cameras are rolling. Go again. At 75. Try the 80. We've got an £80 reserve on this. This is why the auctioneer is trying very hard for 80. We are just one bid away. It's worth 80. Are you sure? This is a tense moment, isn't it? You're finished and done? It's against the lady there. I'm afraid it's not being sold. If you went 80, you'd buy it. unless someone else is going to bid! The lady there at 80. All done at 80. -I'm sort of speechless, really. I am a bit. I was rather hoping that wouldn't sell then. You kind of live by the sword, don't you? -At least we haven't got to carry it back. and love it and that's the main thing, isn't it? It's got another 200 years of life at least left in it. that commode managed to meet its reserve. Let's see if Mark's snuffbox can create a bigger stink. Our next lot sums up exactly what the antiques trade is all about. because things keep getting recycled over and over again. -was found in an old garage in the house you bought? -it's back on the market and it gets recycled. -And by Van Dyck after all! -Hopefully pay the mortgage off, won't it? Let's hope it reaches the £40 or £50 mark. That'd be great, wouldn't it? We're going to find out. It's going under the hammer now. with the portrait of Van Dyck in profile. This could be an important, undiscovered work! -He's bigging this up, old David! Have a gamble. 20. Take two now. 22. 25. 28. -Getting to the top end really quickly. At 50. Goes at £50. On the net at 50. Van Dyck was an important artist. He was a court painter. -And a secret supplier of snuff! Here then at 50. Sold on the net at 50? Who's in the room? Nobody? On the net, then, at £50. Sell at 50. It's gone down. We're happy with that. £50. -Because that was going to get thrown. It really is amazing what people leave when they move. It's extraordinary! A Mini and a Van Dyck! A decent mid-estimate result for Charlie and a few riches for Mark. so let's see if it ticks any of the bidders' boxes. And going under the hammer right now, we have a watch. But not mine because my wife bought me this and I'd never sell it. It was my engagement present. It's not technically Lynn's watch, either. -It was my husband's granddad's. -So it's been passed through the family. Don't you want to let the next generation look after it? -I don't think my boys would like it. They might do when they're older. But it's too late then. You can't buy back your heritage. -Look, it's your decision, OK.
Hopefully, we'll get top end, around 100, 150. If you're going to sell precious metals, now's the time, isn't it? Yes. Good luck. Here we go, this is it. Find out what the bidders think. It's a nine-carat, gold-cased watch by W Philpott of Faversham. That's nice! The sort of thing you should have if you have a waistcoat. £50 for it. 50 I'm bid. 50. Five. 60. Five. 70. Five. 80. Standing at 90 now. Goes, then, at 90. Now we're getting the top end. -In the room at 140. Goes, then, at £140. Right at the back at 140. Nobody else? Finished at 140. Net, you are out. Room at 140. -That was very good. Well done, David Palmer. -Much better than I thought it would go. And I've got high hopes for our next item. This could be a rollercoaster ride, especially for Pauline here. and there is a lot of silver there. not just in our sale today, but I think in the whole auction. -Yeah, I agree with you. The Victorian three-piece silver tea service there. Robert Hennell, nice little lot. We go straight in, £400. At £600 now. Is that it? At 600. You in? 680. 680. 700. Sell then at £720 now. Nobody else? -It's going in the room at 720. The room at 720. All done. At £720. Nobody else? It's gone to the London silver trade in the back of the room. as the three most memorable. and to tell you the truth, it didn't with me. So, how come not many of us have heard of him? nestling between Peterborough and Stamford, to find out. "That every village to an island grows." And you can see why it inspired him, can't you? with no leaves on the trees, it's still hauntingly beautiful. every aspect of nature and English rural life. and the subsequent Enclosures legislation. You could say he was perhaps Britain's first green activist. "But the vast shipwreck of my life's esteems." when his father became ill.
right next door to their small tenement. and I can tell you, the footprint of the building isn't that big. They lived here cheek by jowl, trying to make ends meet. plus the room upstairs, which would've been their bedroom. there were always six kids living here with him. Of course, he had his extended family, as well. and his grandmother living in the next rooms. I guess he would've worked at the table in front of the fire. this vast inglenook fireplace engulfing this tiny room. It would've kept them very warm and snug. and in 1820 his first volume was published. using words such as "pooty" for snail, and "crizzle" to crisp. and he was affectionately known as Northamptonshire's Peasant Poet. But sadly, the success was short-lived. and a fickle public chose to ignore him. His subsequent works fell out of favour. which rapidly developed into a serious mental illness. In 1837, he was admitted to an asylum in Epping. and that he also had two wives. Clare spent his last days in an asylum in Northampton. from years addicted to "poetical prosings". his celebrity all but forgotten. and The John Clare Trust. and set about faithfully restoring it. so it is open to a whole new audience. write some poetry of your own and post it here in the dovecote. brought in by Marion have turned Charlie's head. It was the colouring of these plates that really took my eye. the more I became aware of the rather sad condition of them. -I've had them about four years. They were inherited by my mother over 20 years ago, about 1989. Did they come with a history? I think she had them on the wall, because they had hangers round them. Classic thing that people did. These are tin-glazed. and they chip very easily. but a huge great bite is a different matter. -What do you think they are? but it's really quite possible that they are Dutch Delft. The vibrant yellow seems to me something of a Dutch influence. -I thought late 1700 and something. Earlier than that. But you're in the right century. They're 18th century. I would put them at 1740, 1750. -So they've done remarkably well really, haven't they? is that the damage isn't terminal with them. almost part of the charm. I'm going to just turn this over here. This is a problem, the crack. But it's still in one piece. I can see it's been taped up at some stage. We haven't done that, but I think it was at one time. I don't think it's been in pieces. It's just possible they glued it and then taped it. -even with the chips, they would look lovely on a dresser. -Have you had them on display? -No. They've always been packed up. We only rediscovered them a few weeks ago. -Why don't we let someone else enjoy them? Have you ever had them valued? My husband took them up to a well-known auction house. -And they said they thought they might be worth about £100. I think they might struggle to make £100. But I'm going to put these at 80 to 120. "He doesn't know what they're worth." That is what I think they are worth. with a discretionary reserve at £80. -Do we need it is as high as that, the reserve? We don't need to, madam! We can go as low as you like! -We thought about 30 or 40 and we'd let them go. so I'm prepared to do a compromise. -but I'll settle with a reserve of 40. If they don't make £40, put 'em back in a box! I know you don't want to. Give them to me for Christmas! -I don't think you're allowed to do that! I agree. It would be a shame to see those plates go for peanuts. Here's hoping someone will come to their rescue. with a few showbiz stories. Are you a Shakespearean girl? Not really, no. We went to see this at Stratford. As you see, it was 60 years ago. I can't believe it. ..Michael Redgrave and Richard Burton, later to become Mr Taylor. -Who's this famous lady at the top? -asking if they could get the signatures. -They came back with Michael Redgrave and Richard Burton. -I went to a carol concert where Robert Hardy read a lesson. -And so I thought, "Right..."
"Please would you sign this programme that I got? "And you were in it." And so he said yes and signed it. -What do you think they're worth? -I'd like to get £50. And one, I think, made £50 and one made £160. -The 160 one was on a photograph postcard, so that's worth more. -But we've got Redgrave and Hardy. -I think we should put an estimate on them of perhaps £40 to £60? -Shall we perhaps put a reserve on them of £35? -It'll be a bit disappointing if they only made 35. But with a bit of luck, you might get your 50 or 60. This is your "Flog It!" day out. This is my "Flog It!" day out indeed! And I've really enjoyed it. It's been fantastic. Yeah. when it goes under the gavel. Meanwhile, temperatures are soaring over on Charlie's side of the room. and I don't think I've seen a fan in such wonderful condition. It's just been tucked away in a drawer for about 15 years. -No, we bought it in a box of odds and ends. -You bought it in a box of odds and ends? -I suppose you could do that in those days. But this was one you didn't like. -so we just put it away, as you do. -Well, you do, I don't! I wouldn't have tucked it away! I'd have come running to "Flog It!"! -What else was in the box? -I can't remember. Bits and pieces. I reckon you brought the best bit along today. -This is Cantonese. Do you know how old it is? -Turn of the century, last century? You're rather good at this! This is about 1890, 1900.
has gone through the roof in the last five years or so. it tells a story all the way through. half of his body's on that panel, half of his body's on THAT panel. And same with the trees. It tells a story all the way through. It is quite remarkable quality. I'm sure it's ivory. I needed to check that it wasn't plastic. Plastic dates from a lot earlier than a lot of people think. But this is undoubtedly ivory. because it's slightly discoloured on the outside parts of the fan. But I'm delighted with it. How much did you pay for this box of stuff? -Did that include the box? -We got the box included, yes! That's absolutely... Pfff! I think that's staggering! -I think this could be worth 300-400. I'll be sensible with the estimate. I'll put 200 to 300 on it. I don't want to go over the top. and pop their bids in. -So I think £200-300, if you're happy with that? Sounds as if you might be! We'll put a reserve of 200.
so don't sell it for less than 200.
but it's worth 200-300, minimum. for that exquisite ivory fan. but that fan is fine because it dates well before 1947.
pepper shakers that Evelyn has brought in. -Are you on your own today? -And are these yours or...? -No, they belong to my husband. -Does he know you've brought them? -But he'll be able to make the auction? -How long has he had these? -Not too long, about four years. -Did he inherit them or buy them? a whole load of antiques. Can I ask you a question - a whole load of antiques? -Yes, a whole cabinet full. -So he got well paid. Well, I think these are lovely. We've got the hare and this should be a tortoise really, shouldn't it? and these heads unscrew because you know what they are, don't you? -I think they're both peppers. -Ooh, as old as that? silver ones and so these, in a way, they're almost like a substitute. -I think you should estimate these at £50-80. -We'll put a fixed reserve on them at £40. And then I think they'll do well. Will he be pleased at that? -Won't shout at me if I get it wrong at the auction, will he? Will the bidders go wild for those animal pepper shakers? We've got our four items, now we're taking them off to the sale. It's Evelyn up next and she's brought husband Dave along with her. Well, hopefully we'll get that top end. Why have you decided to sell? -and they just really need offloaded. I hope you're pleased with the price. -I think they'll do all right, actually. -And I think we should get the top end plus a bit more. Yeah, we're going to find out right now. This is it. Oh, the hare. It's a hare, isn't it? And an owl. That's neat. I like that hare and the owl. 30. 32. 35. 38 I've got. At 38. Net, go 40. 40. You in on this, on the phone? 48 with the net. At 48. Oh, come on. This hare is seriously cool. At 48 I sell with the net. At £48. Nobody else? Done then at £48. You're all done at 48. -I think the hare is lovely actually. -It's all on the internet, you see. -This is where the collectors are. -The faceless bidder at £55. Nobody else? Done at 55. £55, the hammer's gone down. -That was a good estimate. because you get here and you see how wonderful the item looks. I bet most of our owners go, "I wish I wasn't selling this." When they looked that good, I nearly bought them myself. I have to say they flatter to deceive a bit. They looked good and they managed to make a pretty good price, too. and I hope you've enjoyed watching the show so far! because right now it's a classic case of buy-one-get-one-free. I've just been joined by Marion and Charlie. Going under the hammer, two Delft plates, one with a whopping crack. since my mother inherited them. She always wanted to sell them. Marion didn't like my reserve of 80! Do you know what she did? Halved it! Let's find out what the bidders think of these wonderful plates. and it's possibly the oldest thing in the room so far. Two mid-18th century Delft plates. These are rather nice. £20 for those. 20. Two. 25. 28. 30. At 30 now. Done, then, at £30. Surely... We're not done. We're far from done. 42. At 42. On the net at £42. 45. New money at 45. 48. 50 off you, madam. 55. You're too slow anyway. 55. Here at 55. 60. -We're getting there slowly to a respectable figure. In the room at 70. 75. At 75. 80. With the lady at 80. -I sell in the room at 80. You've lit the screen up. I don't know if that's a bid or not. In the room at 80. With you, madam, at 80. Nobody else? Sold on the second row at 80. They are that big in real life. Crack! Yes! That's more like it, isn't it? -Didn't it struggle to start with? At least I'm not going to have to collect them back again! but Marion's plates certainly did some damage in the saleroom. On stage now, Michael Redgrave, Richard Burton and Robert Hardy. Well, in the Shakespeare programme, that is. They belong to Gill. Unfortunately, she cannot make it today. But the curtain's rising for our lead star, it's Mr Philip Serrell! She was lovely! What's happened to Gill? She's not very well today, sadly. Now, Richard Burton, one of my favourite actors. What a voice. -Surely Richard Burton's worth £60 alone, isn't he? We're going to find out if there are any "actor"
kind of luvvie-types that would want to buy this! -They're going under the hammer now! Who's it signed by? Michael Redgrave. Various interest in this. 25, 28. At 28 now. 32. 35. At 35. Is that it? A little bit of theatrical memorabilia. All done at £35. Done at 35. -It's gone. It's had its time. so it's made its money. -Let's just hope that Gill gets better. It hit Philip's reserve bang on. Let's hope that £35 brought some colour back to Gillian's cheeks. and I'm really hoping we hit the jackpot with this one. -Great to see you again. -Which one of you found it? Kate Bateman, she said totally agree with the valuation. We've got an awful lot of Chinese and Eastern artefacts in the sale. It's bringing in overseas buyers. Hopefully, they'll pick up on this. -who I think might well be having a bid for this. So we could have a big surprise on our hands. As you open it up, all the figures follow through. They make a little story. Let's start at £150. 150 I'm bid. 190. At £190 now. Done, then, at 190. 200. 220. -I must brush up on my Cantonese valuations! At 1,000 now. And 50. Phone, are you in? 1,200. 1,300. 1,350. Net at 1,350. Yes, get in now. 1,400. At 1,400. -That's amazing. That is incredible. Phone at 1,800. £1,800. Anybody else? At 1,850. I sell with the internet at £1,850. -At 1,850. Down here at 1,850. Any of you in the room? Never mind, Charlie, you can be wrong as often as you like! I'm going to become a decorator! That's where the big money is, the Far East. It's a lot of money. There's commission. It's 15%, plus VAT. -You probably hadn't thought about what you'd spend £200 on. What a marvellous way to end such a brilliant day here in Stamford! Everyone has gone home so happy! If you've got something like that, we want to see it. well, I think we're all going out to celebrate, don't you? It's cheerio. See you next time for more surprises. Paul Martin presents from Peterborough's magnificent gothic cathedral. The locals have turned up in their droves and, with so many bags and boxes to sift through, experts Philip Serrell and Charlie Ross certainly have their work cut out. While Charlie has his head turned by a beautifully preserved Cantonese fan, the bottom falls out of Philip's world when he discovers there's a rather big flaw in the Georgian chair he'd had his eye on. As Paul sets off to explore the surrounding countryside, he sheds lights on a forgotten 18th-century literary talent, Northamptonshire's peasant poet John Clare.